May 17, 2015 - On Saturday a single-engine Piper PA-24-260 Comanche, N9032P with a family of four had departed San Antonio-Kestrel Airpark, Texas. Shortly after takeoff, about 12:30 PM, the aircraft crashed on a parking lot at Strutty's Feed and Pet Supply on the 4800 block of U.S. Hwy. 281 killing all onboard. Capt. Tommy Ward of the Comal County Sheriff's Department said "Deputies arrived on the scene and found the plane crashed on the ground, and fully engulfed in fire." 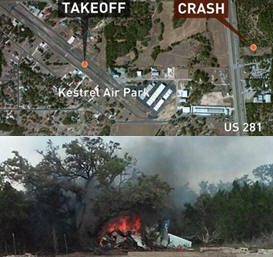 An eyewitness said "I saw the plane come right over the trees and it was going straight. And then all of a sudden, it just kind of turned a little and went nose down." 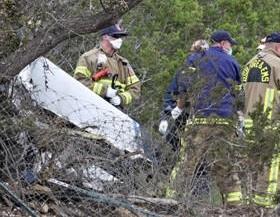 The Comal County Sheriff's Office identified the family of four as the pilot as Michael Scott Galloway, 38, of Spring Branch. His wife Heather Louise Galloway, 32, and their two children, Clayton T. Galloway, 10, and Cheyenne Elizabeth Galloway, 8. Heather Galloway worked for the Comal County Independent School District as a bus driver and their two children were students at a school in the district. Michael Scott Galloway was a licensed private pilot and A&P aircraft mechanic. The aircraft was manufactured in 1966. A friend of the family said "As far as I understand, he had just got his license not too long ago. He loved it and was just taking them out to have a good time." On The FAA Registry Aircraft Inquiry site indicates the aircraft is owned by Charles Torkelson. However, Torkelson said he gave up the aircraft over a year ago in an insurance settlement after a mechanic who was performing an annual inspection had accidentally ran the aircraft into the hanger, causing significant damage. Torkelson's insurance carrier had considered the damage to the plane a total loss. He further stated a salvage company called Wentworth Aircraft in Minnesota purchased the aircraft from the insurance company and then later sold it to Galloway. Torkelson believes Galloway did not update the aircraft registration certificate with the FAA.